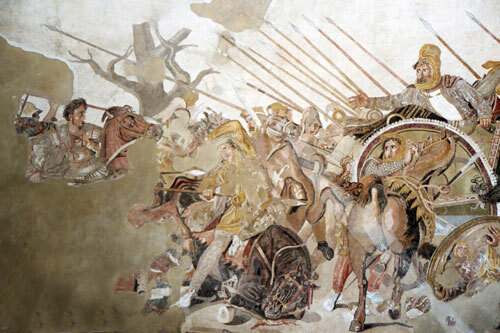 Did you know that Alexander the Great had a mosaic named after him? The Alexander Mosaic is a famous Roman floor pavement from the House of the Faun in Pompeii dating from circa 100 BC. It illustrates the battle between Alexander the Great and Darius III of Persia, known as the battle of Issus. What’s most impressive about this mosaic is that it is made from about one and a half million tesserae (tiny mosaic tiles), of four colors: white, yellow, red, and black. The mosaic, copied from an earlier original painting by Philoxenes, measures 5.82 x 3.13m and shows the amazing Greek monumental work. Today, and after being removed from the House of the Faun, the original Alexander Mosaic has been on display at the National Museum of Archaeology in Naples since September 1843. It is considered to be one of the most celebrated ancient mosaics to have survived into the modern era.